LE SILLAGE is a niche artisanal-fragrance specialist—a rarity in Japan even today. From Japanese made perfumes to highly artistic niche brands, LE SILLAGE stocks a wide range of fragrances. LE SILLAGE is also still the only store in all of Japan today which not only stocks such a wide array of fragrances but also lets you sit down at the counter and freely try out and choose fragrances at your own pace. At LE SILLAGE, the perfume loving owner—who studied at Ateliers Aromas and Parfums Paris and boasts an expert knowledge of fragrances—offers consultations where he will listen to your perfume preferences and, with a kind hand, will give you a detailed introduction to both the world and story of each fragrance. The name of the store, “SILLAGE” (see-yazh), is a French word that refers to the trail of scent left behind a perfume. The owner chose this name because he hopes that those who come across their perfect scent at the store will, in turn, find happiness and make those around them happy through leaving behind a wonderful sillage. At LE SILLAGE, encounter and experience highly personal fragrances, that will help brighten your everyday. CIRO was founded in New York, USA, in the 1920s and was the first ever niche fragrance brand. Up until its temporary closure in the 1960s, CIRO captured the attention of fanatical fragrance lovers with its audacious design and uncompromising quality. In 2018, a collection of six perfumes breathed new life into the CIRO name with its modern spin on the over 100-year-old brand. The refined fragrances—made from the extremely concentrated pure essences of the highest-quality ingredients—are absolutely astounding. From the impressive play on the contrasts of black and white and light and dark, to the beautiful, elegantly curved silhouette and high-class look and feel of the gold-leafed cap, these perfumes are uncompromising on even the smallest details of their design. Whether it be design, fragrance quality, or even originality, CIRO is top of its class in every category. LIQUIDES IMAGINAIRES is an artistic collection of perfumes with almost aphrodisiac like fragrances that appeal to all five senses. LIQUIDES IMAGINAIRES was founded by two successful and experimental perfumers, designer Philippe Di Meo and hunter of rare fragrances David Frossard. These two men created LIQUIDES IMAGINAIRES based on the concept of returning to the origins of perfume. They chose to focus on the mysterious sacredness and eroticism of perfume, neglect marketing conventions and create what they truly wanted to create without boundaries. LIQUIDES IMAGINAIRES’ extremely high-quality fragrances based on unique ideas—including blood like sacramental red wine, the earth, the heavens, tree sap, and even a purple island—will entice you on a trip to confront your innermost self. PARFUM SATORI is a brand of fragrances by the perfumer and member of “la société française des parfumeurs”, Satori Osawa. Satori Osawa’s profound knowledge of the Japanese arts of Kado (Flower arrangement), Sado (Tea ceremony), and Kodo (Japanese art of fragrance) and respect for Japanese history and culture are the foundation of her creativity. Japan’s distinct four seasons—together with the love for the delicate flowers and aromas of the rain, snow and nature they bring—are all reflected in Japanese culture. PARFUM SATORI, which bottles those beautifully unique Japanese scents, is a Made in Japan collection crafted completely of Satori Osawa’s own original recipes. Furthermore, the Michelin guide of perfumes, “Perfume the Guide 2018” gave five of PARFUM SATORI’s perfumes (Hana Hiraku, Oribe, Silk Iris, Sakura, Satori) four-star ratings. Miya Shinma PARFUMS is a fragrance brand from “la société française des parfumeurs” member Miya Shinma. Miya Shinma PARFUMS was founded on the principle of nature’s unchanging beauty, the thoughts and feelings born from it, and the brand’s philosophy of “Obey the art, Obey nature.” The aroma of these fragrances—which don't hold back on their use of the finest ingredients and were designed to bring out the inherent appeal of the natural aromas—are the epitome of luxury. Endlessly simple ideas are where the endless possibilities of art lie. Each perfumes’ beautiful black lacquer box and name, which express the characteristics and beauty of written Japanese, come together in a simple, yet original, delicately moving design. LE SILLAGE stocks 120 perfumes of about 12 niche fragrant brands, all of which were created by talented perfumers seeking originality and artistry, and produced and distributed in limited quantities. For that reason, in order to find the perfect one, customers are able to freely try any of the vast array of fragrances. LE SILLAGE’s line up of fragrances difficult to find anywhere in the world, let alone in Japan, make a great gift for family, friends or even as a souvenir for yourself. 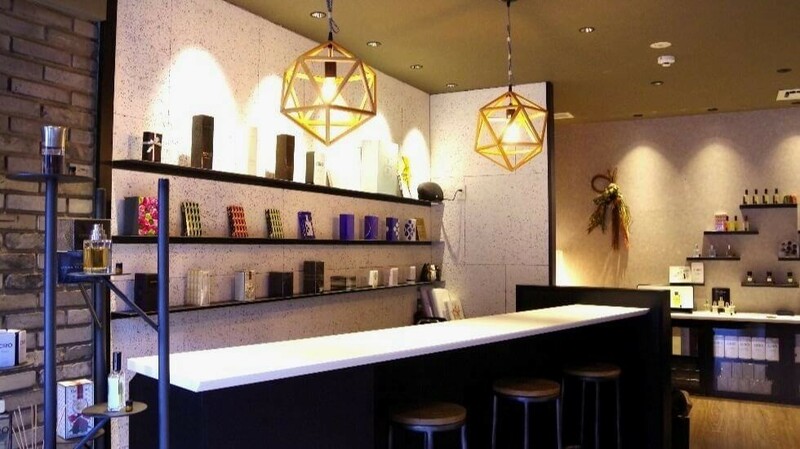 For anyone who is at a loss as to what fragrance to choose, you can sit down at the bar like counter, enjoy some free drinks, receive a casual consultation and spend some time thinking over which fragrances you enjoy. There are a ton of reasons I can recommend this store for, but the reason why I personally like this store, because the owner, Yonekura, loves perfume. Yonekura simply radiates “I love perfume!” and works hard to try get more and more people into them too. When I visited the store, Yonekura tenderly followed and worked with me until I found a fragrance that I liked. (I ended up being there for over two and a half hours!) I always prefer to go shopping where the people working have a love for what they’re selling, so for that reason, I thought this store was incredibly compelling. This store is fantastic for those who love or even just have an interest in fragrances, so I highly recommend checking it out at least once! I’m sure that just like me, after receiving customer service from Yonekura, you’ll think “I’ve gotta come again” too! 11:00～19:00 *Regarding visits outside of opening hours, please inquire by phone. The owner can speak basic English. Also, some of the merchandise has English pamphlets as well.